Long story short I bought myself a new DELL U2713HM and I was looking forward to playing games on Dolphin in 2560x1440, but it seems like Dolphin's highest supported resolution is 1920x1440. Is this some kind of bug or is it supposed to be like this? And is there any way to bypass it? (09-23-2012, 12:12 AM)Ninjaflipp Wrote: Long story short I bought myself a new DELL U2713HM and I was looking forward to playing games on Dolphin in 2560x1440, but it seems like Dolphin's highest supported resolution is 1920x1440. Is this some kind of bug or is it supposed to be like this? And is there any way to bypass it? 4x IR is something like 2560x2112, more than enough for your display. You can go higher by setting your IR to Auto (Window Size) and making the window bigger or entering fullscreen. You need a screen with a resolution higher than 2560x2112 to actually go higher than 4x IR in Dolphin, obviously. Are you using a dual link DVI or displayport cable? They are required for resolutions that high. I have never seen that resolution mentioned in context with other hires displays before. That is seriously ridiculous. I knew it was the highest resolution mobile display, but I didn't realize it outdid most consumer-grade desktop displays. (09-23-2012, 12:12 PM)Axxer Wrote: I have never seen that resolution mentioned in context with other hires displays before. That is seriously impressive. I knew it was the highest resolution mobile display, but I didn't realize it outdid most consumer-grade desktop displays. If it had the GPU to back that up, it would be. Otherwise it is a bit ridiculous. Also, why don't other companies make ultra DPI displays for desktops with the power to actually back the resolution up in-game? 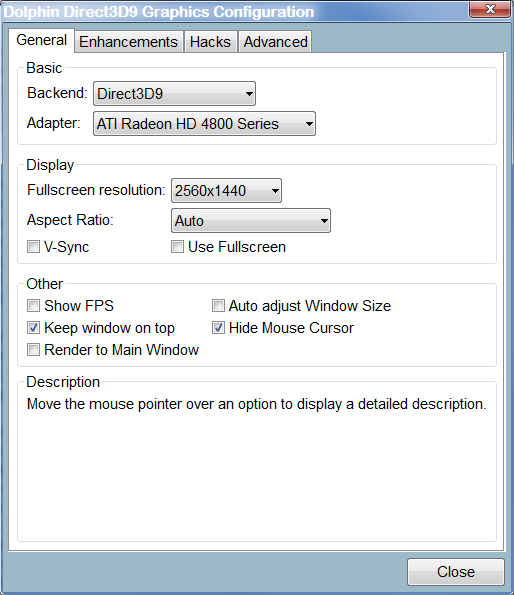 (09-23-2012, 10:21 PM)AnyOldName3 Wrote: Also, why don't other companies make ultra DPI displays for desktops with the power to actually back the resolution up in-game? Probably because with the exception of OS X Mountain Lion (and maybe Windows 8? Dunno much about Win 8 atm, been ignoring it), most OSes don't scale that well when increasing the DPI that high. On Windows XP and 7 (what most of the world runs) you'd get tiny little icons and anything else the OS displays as bitmaps. Blowing them up to make it look better would make them blocky and pixelated icons, but at least they'd be clickable. I suppose it wouldn't be an issue for desktop environments that use vector graphics for some of its components (e.g. SVG icons look great nearly at any resolution). However, OS X Mountain Lion is the only desktop OS I know that was designed with things like retina displays in mind. I'm pretty sure the main reason is because it's ludicrously expensive to develop such a large LCD display with such a high DPI (using a custom panel I might add) and hardly anyone would buy it except apple fans. Making GUI elements bigger is pretty easy. As for them become more pixelated, I don't really think that's such a big deal. I've raised the GUI size before by tweaking the windows DPI setting and it doesn't look bad at all.